To acknowledge OMers who have excelled academically, NorCal OotM offers a scholar Varsity jacket patch. 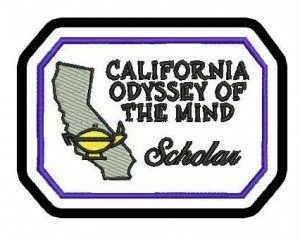 Any high school student participating in NorCal Odyssey of the Mind can apply, but you can only receive one patch during your high school years. Please make sure that you fill out the application completely, and provide all of the required documentation. The patch will be mailed out as soon as the application is approved, and your award will be acknowledged at the state tournament. In order to qualify for the patch, you must have earned a 3.5 weighted GPA for two or more semesters, and submit one signed letter of support, from a councilor, teacher, or Odyssey coach. Your GPA will be verified by submitting a copy of your transcript. Materials submitted for review will not be returned.